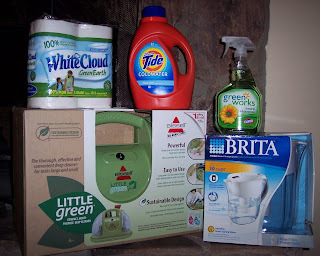 I won all this great stuff from Mommydaddyblog! How cool is that? I usually never win any big prizes so I am extra excited about this one. I have already started using the Brita pitcher and LOVE it! I encourage you all to check out all the great things happening at Mommydaddyblog, especially the Buzz. You just never know what you will get! Thanks Sheena!! I love me some Sheena--she and Greg and that beautiful baby are just a treat. Congrats! That's a nice loot to win! Very useful! Whoa! That's a lotta swag. I am soooooo excited for you!!!!!!!!!!!! YES YES YES!! !